If you're going to play paintball, your first purchase should be goggles - even before you buy a marker! All goggles are NOT created equal, and everyone has their opinion on what is best. Both paintballers and airsoft players agree that fogging can and does happen on all goggles, but not when you apply FogDoc. You can't hit what you can't see, so get the FogDoc advantage! If you are going to ride, you need an approved helmet and face shield. When your vision is blurred for any reason, you are at risk! Worry about your placement in the race or that extra air off the jump - not whether you can see through your steamy lens. Apply FogDoc and reduce your stress, improve your safety, and climb the podium! Got Snow? Maybe you love the half pipe at 8am Tahoe, or maybe you're snow shoeing in Utah with family. Exercising in the cold feels great, but your biggest obstacle to enjoyment can be your fogged lenses! On goggles or glasses, apply FogDoc to see the lip of the pipe or the trail ahead. Stockcar drivers, street racers, truckers, delivery crews - all of them are driving towards the goal. Nothing can slow you down like blurry windshields, but FogDoc helps everyone in the drivers seat. When that old defroster can't keep up or you are in extreme conditions where coming in second is not an option, apply FogDoc and know that you will see it all! Police, Military, Fire, Construction, Welders - the list goes on and on. YOU work hard to do your job for others, and not seeing clearly in an emergency is unacceptable. Not seeing clearly can put you and others in harms way. Whether it be glasses, masks, welding hoods, shields or whatever protects your sight, FogDoc will keep you clear and fog free so you can continue to work hard! Here at FogDoc Industries, we're constantly looking for problems that require a fog-free solution. Feedback is the most important part of our business, so tell us what YOU are using FogDoc for! The user shall determine the suitability of the product for his or her intended use and shall assume all risk and liability in connection therewith; fogdoc.com will not be liable to you (whether under the law of contact, the law of torts or otherwise) in relation to the contents of, or use of, or otherwise in connection with, this website: 1. for any indirect, special or consequential loss; or 2. for any business losses, loss of revenue, income, profits or anticipated savings, loss of contracts or business relationships, loss of reputation or goodwill, or loss or corruption of information or data. These limitations of liability apply even if fogdoc.com has been expressly advised of the potential loss. Please contact admin@fogdoc.com should you have any questions or concerns. 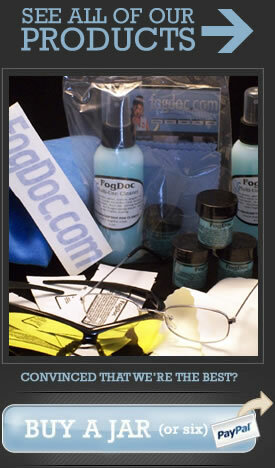 Stops glasses, goggles, mirrors, shields, lenses and more from fogging. While cleaning the surface to a crystal clear shine. Safe and alcohol free. Increases vision and clarity. Anti-static, dust/dirt repellent. Lasts 5 times as long as other products at half the price! You can have the best paintball marker, the best motorcycle, the biggest air on the half pipe and a perfect weekend – but all of that can be ruined with dirty and or fogged lenses. FogDoc provides the most bang for your buck when you’re out having fun. Apply to clean/dry surface with no residue of any other product (glass cleaner/other antifog products/alcohol etc.) Add FogDoc with fingertips. Rub product on surface until hazing occurs, let sit for 30-60 seconds and buff off with a clean, dry microfiber cloth. For best results apply to inside surface for crystal clean shine, and best of all NO FOGGING. Reapply as needed. Safe for contact with all glass, mirror, acrylic, Plexiglas and plastic surfaces. FogDoc is best used on Goggles, Helmets, Face shields, Glasses, Masks and even chrome or any surface that has a tendency to fog up or just needs a good cleaning. It is not necessary to over apply FogDoc. A small amount will treat a large surface. Test FogDoc on your application to determine how much product is needed to achieve desired results. Can be used for general cleaning also. Keep in a cool dry place, place in refrigerator to re solidify if needed. The mild ingredients are safe on all lenses and coatings, including anti-reflective coatings. Simply apply with your finger tips and wipe off with a microfiber or non abrasive cloth. It comes off leaving a clear film that prevents fogging, cleans the lens and even polishes the small scratches, making cleaning in the future even easier! This awesome product is safe for hundreds of applications and available in the convenient 1/2oz jar with a re-sealable lid. Use it as often as you like for clear, clean, smudge and fog free vision. See the world in your eyes, see it Fogdoc clear! FogDoc wants to make you happy and fog-free. If for some reason you are unhappy with our product, we provide a Money Back Guarantee – just contact us and if we can’t help you solve your fog problem, ship the remaining product back to us with proof of purchase within 30 days and we will refund product purchase price once received.Shipping not included. We are confident in our product and in the satisfaction expressed by our loyal customers. Fogdoc.com is owned and operated by 36 Hour Days. 36 Hour Days LLC is now ready to supply all stores, resorts, shops and fields through out the USA with FogDoc’s line of cleaning and lens care products at wholesale prices! Download a Dealer Application. Lets begin to work for each other! We ship USPS flat rate priority for international shipping. By purchasing an international order you agree to these terms and understand FogDoc takes no responsibility for issues with orders leaving the United States due to shipping restrictions or customs. Contact us via email for USPS Money Order or checking payments! Have a question or comment? Feel free to drop us a line. Or maybe something a bit more lengthy? Seeing is believing, but testimonials sure help. I just used this stuff again after it sat in my gear bag for three years. It still works awesome. Used it on my glasses under V-Force Morphs in 90+ degree weather and hard playing. NO FOG WHATSOEVER! This stuff is outstanding! OMG THIS **** IS THE BEST ANITFOG EVER, EVERYONE WITH MONEY SHOULD BUY THIS STUFF! IT WORKS SO WELL!